The Hadiya case has quickly turned into a war of political interests between Hindutva and Islamists. Prima facie, the issue is simple. A woman choses to convert to another religion and marry a man of her choice from that religion. Enter evil parents. The marriage is anulled. Hadiya is becomes a prisoner. Clamour grows with the Hindutva pride seeing exploitation, while the anti-Hindutva prejudice seeing nothing but a matter of choice. I don’t see the issue as that simple, and for once, I agree with all parties. I definitely applaud the courage of Hadiya in sticking to her choice and taking it all the way. While I restricted myself to stating this, all was well. The problem arose when I also understand the perspective of the father as well as the courts. In my view, this is a complex issue with several factors that need considering. The high voltage drama around the issue has ensured it is largely reduced to accusations of love jihad and scoffing at the accusations with complete inability of both extreme stands to actually understand the issue beyond the lens they are habituated to. For me, this is not a religious issue in the sense of Islam or Hinduism or whatever, but it is similar to countless instances of women (and men too) being infatuated with a belief system to the point of cutting off their previous life. It isn’t a matter of choice of religion or choice of husband, but a matter of a series of choices that literally amount to abdicating her entire family, name, identity, residence, marital status and more. It is a series of extreme and life changing decisions in rapid succession. This is where the case is a cause for concern. She is literally abdicating the person she used to be in order to embrace a completely new way of life. It is clear that she is convinced about this. It is equally clear that those cheering for her are convinced that it is the right thing. But if you take off the lens of specific religions, where have we seen similar behavior? Well, we have seen women leave their families and join the Sanatan Sanstha (a Hindu extremist organization). When their concerned parents tried legal means to get them back, the girls informed them that they had joined the Sanatan Sanstha by choice. They accused their parents of abuse. A more recent example would be when the parents of two sisters in Bombay filed a complaint against Sunil Kulkarni who ran an “organization” called Shifu Sankriti for entraping their daughters who…. found his cult and left their parental home. They accused Sunil Kulkarni of entraping their daughters, giving them drugs, sexual exploitation and what not. The daughters rubbished their claims in court and accused the parents of domestic violence. Other parents too have made similar complaints, but those who followed him have not spoken against him. Sunil Kulkarni is not Muslim, none of those accusations were proved. He was arrested anywayand is still being denied bail. The girls of the college in Dera Sacha Sauda had released videos endorsing Ram Rahim and angry with the state over his arrest. I’d post a link, but that is one sad video I wish I could unsee. While it is tempting to see this as an issue of religious choice or prejudice against minorities or love jihad, the fact is that there are patterns to people suddenly immersing themselves in a new faith they find. And sometimes the patterns are suspicious enough to raise serious questions on whether the person is acting of their own will. This is not limited to any specific religion or cult. However, it usually happens when there is some kind of fundamentalism or cult going on. Merely being interested in and following religion does not lead to an abdication of family and loved ones, home and routine life and a complete immersion in the new lifestyle. Hadiya didn’t just embrace Islam, she changed her name, her dress, her educational goals, she got involved in an Islamist organization, and she quit her family, stayed with several new acquaintances in quick succession. When legally challenged, with the assistance of her new associates, she came up with another Islamist to marry! A parent who wouldn’t be alarmed by something like this is hard to find. This is not merely a change of faith or interreligious marriage. For something like this to happen, the mind is completely captivated by the promise of the new faith and completely disinterested in existing life and loved ones to the point of losing all realistic view. In that sense, the NIA is not altogether wrong when it speaks of indoctrination subverting consent. The bigger problem is that the NIA seeing it as happening only as the pet bogey of love jihad, when, in fact it happens across religions, cults, politics and even love marriages with gullible minds absorbing visions of utopia and giving up anythign that would deter from chasing that infatuation. Anything that drastically changes life while looking at limited aspects of a situation based on information promoted is suspect. For that matter, even if an atheist were to suddenly turn hostile with family over suddenly discoverign that there is no God, it would still be a suspect state of mind during which they probably should not take life altering decisions. One of the wisest pieces of relationship advice comes from the polyamory community, to enjoy a new relationship, but to not make any life altering decisions while under the influence of NRE (New Relationship Energy). Something like this applied to matters of changes in beliefs – whether political or religious would mean to learn more, engage, enjoy more, but not burn bridges with existing life in rapid succession to rely solely on new choice for all matters – even those unrelated to it. That said, what should be done about such subversion of free choice is anyone’s guess. Many people indoctrinated continue to live what is to them a normal life. Many times indoctrination can be inadvertent rather than deliberate (happens in most homes where kids learn to think in black and white prejudice). While being indoctrinated may be unfortunate, there is no objective way to assess it and thus acting on such an evaluation always runs the risk of violating rights. Even if it is a mistake, it is that person’s mistake to make, after a point. Also given how highly charged these kind of situations can be, there is great potential to both frame people as well as get away with indoctrination if it is the “right” kind of indoctrination. But I am glad this case hit the courts. 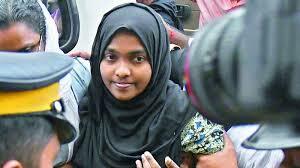 Hadiya must indeed have the right to choose her way – even if it is wrong (which in my belief it is – drowning in religion/religious politics, in my view is always suspect). But I am glad that the process kept the space open for her to pause for breath and think things through very seriously. At the end of the day, it is her life, her choice. It would, however be useful if people who claim to endorse human rights contributed to creating a larger picture instead of abdicating all responsibility to prevent exploitation (that is what brainwashing is, fundamentally) in their eagerness to present an unambiguous and ringing endorsement of whatever the cause they are showing off. Whether minorities or women’s right to choose or opposing Hindutva propaganda, or whatever. Because at the center of such situations are very vulnerable people living in a virtual reality. It may be their right to live in that reality, but well wishers watching their six wouldn’t hurt. Finally, Hadiya’s father is not a Hindutva activist but an atheist. The court gave her into his custody with guard and restrictions. Nor was his case against Hadiya’s husband – he really doesn’t have the power to order NIA investigations. It may be worth looking at what actions are being attributed to him just because he dared question the holy cow of free choice. He can approach the courts, but the judges do have minds of their own and are not obliged to obey.